Subject: ANNUAL EMAIL NOTIFICATION !!! CONGRATULATIONS !!! ANNUAL EMAIL NOTIFICATION !!! CONGRATULATIONS !!! Congratulations to you as we bring to your notice, the results of the Free Email Computer Ballot Jackpot 'A' draw 1st Category of LOTTO.NL. We are pleased to inform you of the result of the Lottery Winners International programs drawn today, 15/03/2007. 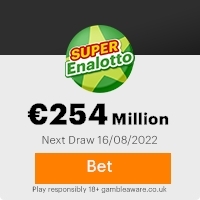 Your E-mail address attached to Ticket number 334/ 660078 with Serial number 05908 drew the lucky numbers 9-43-97, which consequently won in the 1st category; you have therefore been approved for a lump sum payout of �495, 800. 00 Euros Euros. (Four Hundred and Ninty -Five thousand and Eight hundred Euros). CONGRATULATIONS!!! This lottery is a promotional program by LOTTO.NL (Biggest lottery Organization in the Netherlands) to advertise to the world its existence. All participants were selected through a computer ballot system drawn from over 50,000 companies and 2,000,000 individual email addresses from all over the world, as part of our international promotions program, which we intend to conduct several times a year. NOTE: All winnings must be claimed not later than 14 days, thereafter unclaimed funds would be included in the next stake. Remember to quote your reference information in all correspondence. Members of the affiliate agencies are automatically not allowed to participate in this program. Furthermore, we call on you to make sure that you save a copy of this mail and note every letter clearly as stated for we will not be held responsible should there be any complications in this transaction due to laxity on your part. Congratulations once more from our members of staff and thank you for being part of our promotional program. Should there be any change of address do inform our agent as soon as possible. Congratulations once more from our members of staff and thank you for being part of our promotional program. Pls Do not reply to the email address from where you received the information, thank you. Previous: CONGRATULATION ....... ... U WONFresh ScamsNext: CONGRATULATION!!! !YOU ... WON.. This Email with the Subject "ANNUAL EMAIL NOTIFICATION !!! CONGRATULATIONS !!!" was received in one of Scamdex's honeypot email accounts on Sat, 17 Mar 2007 06:47:08 -0700 and has been classified as a Generic Scam Email. The sender shows as "lottnl promo" <lottxl76@hotmail.com>, although that address was probably spoofed. We recommend that you do not attempt to contact any persons or organizations referenced in this email, as you may expose yourself to scammers and, at the very least, you will be added to their email address lists for spam purposes.